Many nice features like: syntax highlighting for multiple languages (JS, PHP, CSS, HTML5,etc. ), Code completion, also supports OOP for PHP, integrated version control (subversion with client TortoiseSVN works great), and many of the same features that most full featured IDEs have, so don’t need to list them all here. Absolutely no support despite what is described on the phpDesigner website – e.g. : Commercial License get higher priority for email support. I bought the Commercial license version for $100, used it for just over a month, and then sent 2 emails about my issues. It’s been several days now, and I haven’t got any response. FTP connection only works on Linux servers. Most of my projects are on Linux, but occasionally I have to edit sites on Windows. From the FTP logs, the built-in FTP client in phpDesigner is sending bad requests to the FTP server. The FTP integration feature is actually just a shortcut that opens Filezilla in a separate window, and is not actually integrated into phpDesigner. 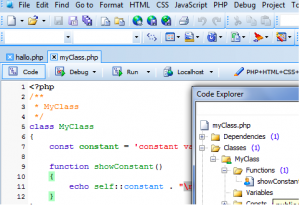 Coming from Notepad++, phpDesigner 8 is a big improvement with many features. You don’t have to install and configure the multiple plugins needed to get a full featured editor. But if I’d known about the issues phpDesigner 8 has (at least with Windows 8, maybe stable in older versions of Windows), I think I would have considered some other IDE/editor first, like Eclipse or NuSphere PhpED. Good FTP support is important, and I need access to most features, especially regular expressions. Okay, I have to revise my review (up to 4 stars. I’d change it above, but I don’t think CNET allows that). The developer did finally answer my emails after 6 days. He said he was traveling and didn’t have email access (one man software company). He suggested I check the font size of the OS, and see if it’s set higher than 100%. Sure enough, he was correct. The font was set at 110%. Setting it to 100% fixed the display problem mostly. Now I can read the title bars, and I can access some missing features, like regular expression on the search feature. FTP is still a problem though. The fact that it works fine in Filezilla and my other editor (Notepad++), and that the FTP error the server is returning is meaningless, than I would say that’s still a bug with phpDesigner 8. I’ll have to continue using Notepad++ for projects hosted on Windows. The fact the develop did respond to my emails and provide some support, and that the display problem was resolved, I have to bring my rating up to 4 stars (I would change the star rating in my original review above, but I haven’t figured out how to do it). 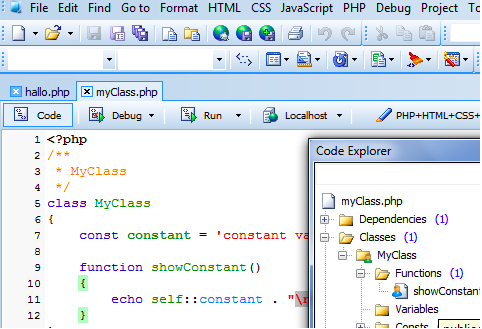 It’s a really nice editor, IDE and debugger worth checking out. You can download and install it with a free 3 week trial. I would test it for the full 3 weeks and try to use all features possible to give it a full test before considering purchasing it. If you’re using it for business, it’ll cost $100.00 for a commercial license. It it’s for learning (ie: you’re not making money from it), then it’s $39.00. get a windows xp vm.. thats what i do on my mac – it has no mac support, which is a bit irritating.. beyond that, its pretty good i think. thanks for the review howevers.. I totally agree. I did finally switch to Mac after using Windows for 20 years. I dumped PHP Designer and now use Sublime Text, and everything works perfectly. facing same problem with FTP integration..